The Internet has grown in unimaginable ways in the past several years and with its growth, new ways of making money online have also been discovered. One such great way to make money, especially for video bloggers is using Vimeo. You can make more money with Vimeo on demand an awesome online on demand video service which lets you sell your videos. Before learning about making money on Vimeo, you obviously need to learn a bit about Vimeo, though if are already a user of it then you can skip a few paragraphs. Vimeo is basically a video streaming platform. In the most simple it can be explained as a site similar to YouTube where you can both upload and watch videos for fun. What makes Vimeo different than others is that the site has both free and paid videos and if you are ready to put some money you can find some good quality entertainment on Vimeo. You can say that basically, it mixes the idea of a paid online streaming service such as Netflix and a free video streaming site such as youtube. If you are looking for entertainment you can find both general free videos and some serious entertaining videos similar to TV shows or web series. Now coming to the big question – How can you make money from Vimeo? Well, the concept is pretty simple. In YouTube, people can make money by the advertisements which are shown before your videos. Advertisers pay YouTube, or I should say Google money to run their ads and the company shares a percentage of revenue with the video maker based on the number the people who watched those ads while watching your videos. However, Vimeo takes a different approach to this and it does not have any advertisements on its site, means you don’t generate any revenue from that. Instead, it makes money from Video on demand basis with a 90/10 profit sharing ratio. It means you can put a price on your videos and every time a user buys it, you earn 90% of the revenue and the site takes 10% of it. The only catch is that for becoming a seller on Vimeo and make money from videos, you need to buy the premium subscription of the site which costs you $240 for one year. Once you are a premium member (or pro as they like to call it) you can go on and upload your videos and put a price of your choice on it. premium membership includes up to 20GB/week of HD video storage, unlimited plays, worldwide distribution, priority conversion, & many more. Then you create a trailer for your videos which is shown to the visitors so they can decide whether or not that video is worth paying for. You can also use its various features to attract visitors and provide them with the best service to ensure you reach your maximum earning potential through your videos. Who should use Vimeo video on demand service to make money? A normal Youtuber earns about $1-2 per thousand views on his videos and even the highest earners get $5 RPM from their monetized YouTube videos. On the other hand, according to Vimeo, the average buying rate for a video per thousand trailer views is 3.2% and even in the worst case scenario, you should get at least 1% buying rate on your videos. It means if you price a video $1 then in the worst case you can earn $10 per thousand trailer views which is double of the highest earning YouTubers get. Although this does not mean that everyone should move to Vimeo video on demand service and in reality it’s suited for very specific kind of people. Basically, there are three types of video creators. First who make videos out of copyrighted materials such as footage of TV show who make videos such as highlights or top ten. These type of video makers should definitely stay away from Vimeo on demand service as trying to sell material whose copyright is owned by some else can get you in serious trouble. Then, there are people who make videos with original footage but it is of home quality, like a prank video or gadgets unboxing or review videos. As you can understand while such videos are better than the ones previously mentioned they are still not something for which people would pay money. Finally, there are video makers who make really high-quality entertaining videos or educational kind of videos, and if you belong to them then you should definitely try to make money from video by selling them on demand. Such videos include web series or single videos which tell a complete story on its own like a short film. Also, educational videos which provide content people really want to learn such as Programming Language or a video about how to make a famous local dish sell well. I am not saying that if you belong to any of the previous two groups then you cannot make money from video by selling them, but your videos really need to be of really high quality for people to buy it. 1. Revenue share – While there are services which charge you more than 50% of your total revenue, Vimeo takes only 10% of your earnings which means you earn the most for the hard work you have done. 2. 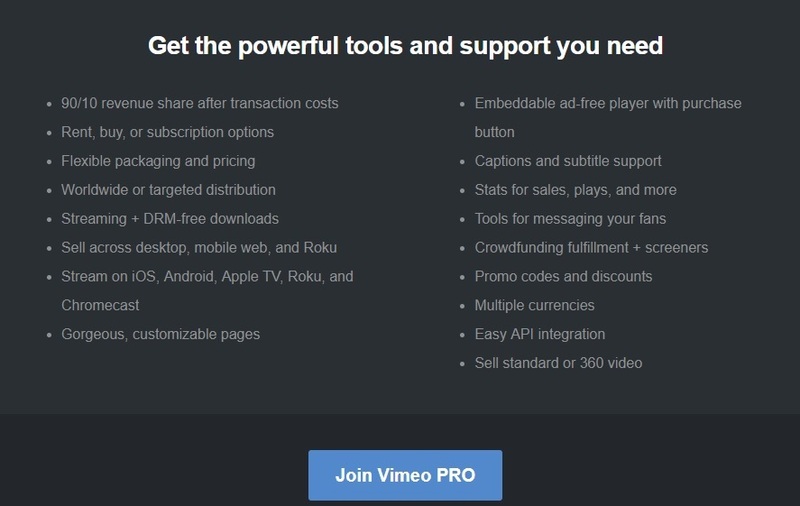 Supported device – Vimeo supports almost all major streaming platforms which mean your videos can be bought by both mobile and PC users, which further adds up to your earning capabilities. 3. Promo codes and discounts: Believe it or not, discounts and special promo codes attract users to buy a thing more than any advertisement you can do and with Vimeo, you can create specialised codes and give a discount to make the most out of special occasions such as holidays. 4. Multiple currencies and payment options – Managing payments coming from various countries and various payment methods can be a tough thing if you are operating on a small scale. Thankfully, Vimeo takes care of all of it so you can concentrate on making the best quality videos. This was our guide on Vimeo video on demand service and how to make money from videos. Do let us know your thoughts on it and what next you’d like to read in the comments section below.